UPDATE, 1:50 P.M. WEDNESDAY: Metro is working on creating a smaller waiting area for BoltBus and Megabus customers. 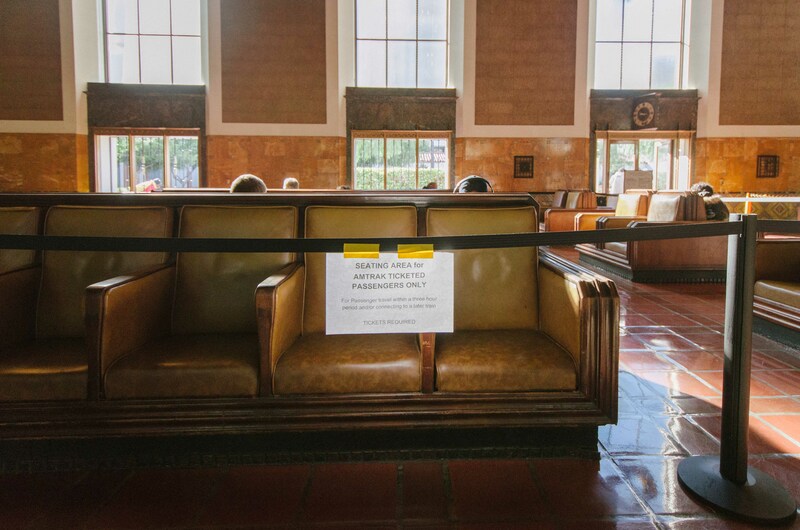 Los Angeles Union Station patrons may have noticed a change that went into effect Monday: the seating area at the front of the facility is now available only for passengers with tickets to board Amtrak or Metrolink trains within two hours of their departure times. Union Station is owned by Metro and agency officials say the change was prompted by an increased number of homeless individuals who have been using Union Station as shelter — an average of 135 per night in recent weeks (numbers were higher over the summer). That, in turn, has at times created extremely unpleasant sanitary issues in the seating area that in some cases posed a health threat to passengers using the station. Metro had been receiving complaints about the number of homeless in the station for quite some time and over the past summer began trying to find some remedies to the issue, said Ken Pratt, the director of Los Angeles Union Station Property Management for Metro. That has included bringing in workers from the Los Angeles Homeless Services Authority who have been meeting with homeless individuals to try to connect them to shelters, potential housing opportunities as well as psychological and medical care. The new rules for the seating area are part of a pilot program. Security guards will be checking tickets in the seating area. The seats are not open to Metro riders because Metro bus and rail service at the station is frequent compared to long-distance and commuter rail offered by Amtrak and Metrolink. The pilot program comes as Metro is beginning more work to restore Union Station, which opened in 1939. In coming weeks, some of the seats in the waiting area will be removed so that wood and metal materials can be reconditioned. .The Tea Party has nothing to do with this. Their main concern is excessive government spending and over taxation without representation. Sound familiar. The MTA board are primarily Democrats. So if you want to blame a group of politicians and their political view point your finger in the appropriate direction. Concerning New York City chasing undesirables away from public plazas. I was the victim of such abuse. I was sitting in one involved in a conversation dressed in my U.S. Army Class “A” green uniform. But I guess it was O. K. to abuse servicemen during the Viet Nam War. I certainly hope the guards will be educated to understand accommodating a disability. I only take the Red Line these days when I go to the doctor. The conditions at Pershing were persistently unsafe and unsavory, and my knees no longer support walking or standing for longer periods of time. On those days when I take the Red Line to Hollywood, I must go through Union rather than to Chinatown to access the Gold Line. Because of the distance, I frequently have to sit for a few minutes to continue on. I don’t want to get chased out of the seats. I have a cane, which should be the first tip off. Please tell me they’re going to be smart about this. I agree with Casual Commuter that the amount of space that is taken up inside LAUS with these 1920s era seats are ridiculous. The space taken up at LAUS by these seats can be better utilized by removing them and converting them to retail spaces. At least that way Metro would be able to collect rent money to pay for janitors that clean the restrooms every hour like oh I don’t know, practically every other shopping mall all over town? If you go to Amtrak stations on the East Coast, they have specific lounges catered for Amtrak passengers, much like how airports has lounges for their best customers and frequent flyers. Why doesn’t Metro, Amtrak, and Metrolink work out a deal to create a waiting lounge and move these 1920s era seat to those lounges instead? If we’re going to be spending millions of taxpayer dollars on the LAUS Master Plan which deals with the exterior and makes zero money, why not spend the same millions of dollars in renovating LAUS’ interior to create a better passenger experience which actually helps create revenue for Metro? So, now if I arrive on Gold Line train and want to get a bite to eat before hopping on the Red Line, I have no place to sit while I eat. Or when I come back late at night, and I don’t want to spend 20 minutes out on the Gold Line platform, I have to stand up if I want to stay inside the station. This kind of “leap before you look” solution to a problem is very frustrating. Amtrak HAS an open lounge, the Metropolitan Lounge. Steve has decided not to cover it. Yet. Ugh 1920s era seats, how old IS the station precisely, nuff said. Let’s destroy the historic character of Union Station so that Metro can make a few bucks and have that clean suburbia mall look and feel. There’s nothing wrong with preserving historic character while creating a new station experience. Have you ever been to NY’s Grand Central? It’s a beautiful, spacious train station with modern shops, a blend of both tradition and modernity. 2. Make any required ADA improvements and finally find a restaurant to fill the vacant Harvey House space. If securing a long-term tenant is not yet possible, consider allowing a shorter-term lease. Having a restaurant there for a year is better than having an empty venue that only gets used for private parties. 3. Move (or supplement) the Amtrak and Metro ticketing areas by reopening the historic ticketing windows and concourse. Replace the seating that was removed from the concourse and reopen and properly maintain the restrooms adjacent to the concourse. 4. Now that more usable space has been restored, consider what areas might be best for additional retail opportunities. @in the valley: The Amtrak Metropolitan Lounge is reserved for business- and first-class passengers only (like an airline’s lounge). Because of that, it’s fairly small and in no way able to serve the vast majority of Amtrak’s passenger load.